Today marks a major milestone in the drive to create a Northern Powerhouse, as the first ever direct, scheduled flight from anywhere outside of London to mainland China launches from Manchester Airport. Also hailed as a significant moment for UK aviation, the Hainan Airlines service to Beijing takes off from Manchester Airport. Announced in October 2015 by the president of the People’s Republic of China, Xi Jinping, the four times a week route will link Manchester and Beijing, opening up a wealth of trade and tourism opportunities. The flights will provide a direct connection for the first time, giving the 100,000 passengers travelling each year between the two cities the convenience of direct scheduled services. The Manchester-Beijing route is worth at least £250 million in economic benefits to the UK over the next decade. Two-thirds of this will be felt directly in the Northern economy in terms of increased jobs, economic activity and tourism. By providing a non-stop service, the new route will also generate journey time savings worth £5 million every year for business passengers and avoid the inconvenience of changing planes at another airport. 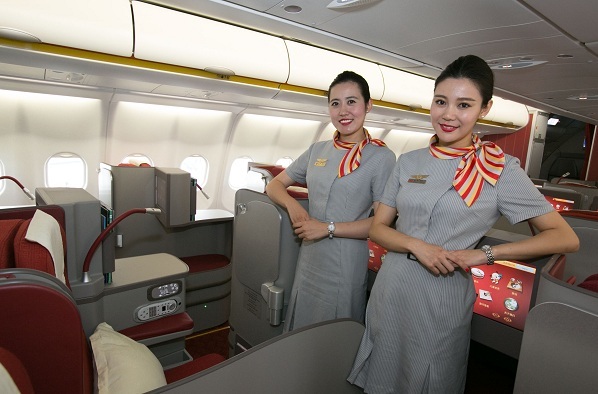 Hainan Airlines - considered the World’s Leading Airline – Business Class by the World Travel Awards - is China’s largest privately owned airline. The four-weekly service departs on Friday, Saturday, Monday and Wednesday, and will be served by an Airbus A330-300. 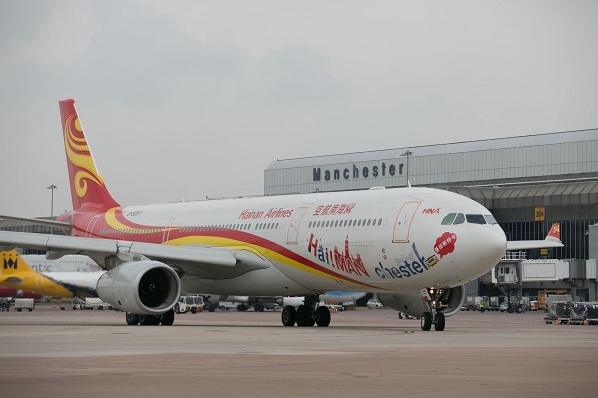 Ken O’Toole, chief executive, Manchester Airport said: “Today’s inaugural flight with Hainan Airlines is clear evidence of the vital economic role that Manchester Airport plays both nationally and regionally within the UK. “Providing a direct link between the two cities unlocks significant trade and investment opportunities, which will serve as a shot in the arm to efforts to create a reenergised Northern economy. The cabin will have 32 business class seats and 260 in economy. Xie Haoming, president of Hainan Airlines, said: “We are delighted to commence our direct scheduled service to Manchester. “Beijing to Manchester’s inaugural outbound and inbound flight load factors have reached over 90 per cent, which is incredibly strong for a new route. “A great number of travel agencies expressed their strong interest in working with Hainan Airlines, based upon the new route, which is encouraging for future travel between the two cities. “With the ‘Golden Age’ of travel starting between China and the UK, it is foreseeable that the market between the two countries is entering a prosperous period.